On the 11th (Mon), identify plant and animal life at Wildlife Areas and then look for all kinds of wild species at Kopara Reindeer Park. Keep things going the next day: explore the striking landscape of Pyha-Luosto National Park. For photos, maps, reviews, and other tourist information, go to the Luosto road trip planning website . Newark, USA to Luosto is an approximately 18-hour flight. The time zone difference moving from Eastern Standard Time (EST) to Eastern European Time (EET) is 7 hours. While traveling from Newark, expect a bit cooler days and cooler nights in Luosto, ranging from highs of 30°F to lows of 11°F. Finish your sightseeing early on the 12th (Tue) so you can travel to Salla. Salla is a municipality of Finland, located in Lapland. 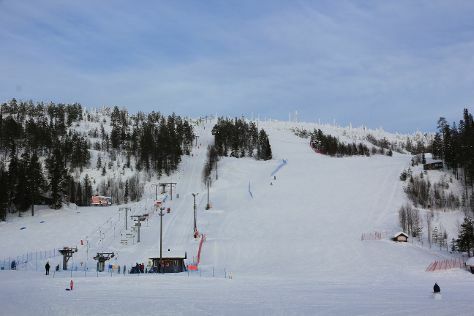 Start off your visit on the 13th (Wed): tour the pleasant surroundings at Salla Ski Resort and then savor a hot drink at Salla Museum of War & Reconstruction. To see traveler tips, where to stay, maps, and tourist information, go to the Salla trip itinerary planning website . You can drive from Luosto to Salla in 2 hours. March in Salla sees daily highs of 29°F and lows of 12°F at night. Cap off your sightseeing on the 13th (Wed) early enough to travel to Inari. On the 14th (Thu), head outdoors with Lake Inari and then pause for some serene contemplation at Saint Tryphon Pechenga Orthodox Church. Get ready for a full day of sightseeing on the 15th (Fri): take in the architecture and atmosphere at Pielpajarvi Wilderness Church, then see the interesting displays at Siida, and then relax in the rural setting at Reindeer Farm Petri Mattus. To see more things to do, other places to visit, ratings, and other tourist information, read Inari route planner. You can drive from Salla to Inari in 4.5 hours. March in Inari sees daily highs of 29°F and lows of 13°F at night. Cap off your sightseeing on the 15th (Fri) early enough to travel to Levi. Start off your visit on the 16th (Sat): make a trip to LUVATTUMAA - Levi Ice Gallery, then see exotic creatures in open habitats at a safari tour, and then gain insight at Kid's Land. To find traveler tips, other places to visit, maps, and other tourist information, you can read our Levi vacation builder . Traveling by combination of shuttle, flight, and bus from Inari to Levi takes 2.5 hours. Alternatively, you can drive; or take a bus. In March, plan for daily highs up to 31°F, and evening lows to 16°F. Finish your sightseeing early on the 16th (Sat) so you can travel back home.